Make it if you’re gluten-free. Make it if you’re not. Make it if you aren’t even sure how to pronounce it. I swear, it’s one of the coolest things you’ll ever work with. And if cool isn’t enough incentive, do you know what choux paste makes? Cream puffs. Profiteroles. Éclairs. Churros. Crullers. Beignets. Gougères. The exclamation mark restraint on that list was huge. Its name may make it seem very fancy pants, but this batter-dough uses basic ingredients, a likely unfamiliar but straightforward method, and comes together super quick. I will warn you that while you’re making it, you’re going to think you’ve messed it up at least half a dozen times. 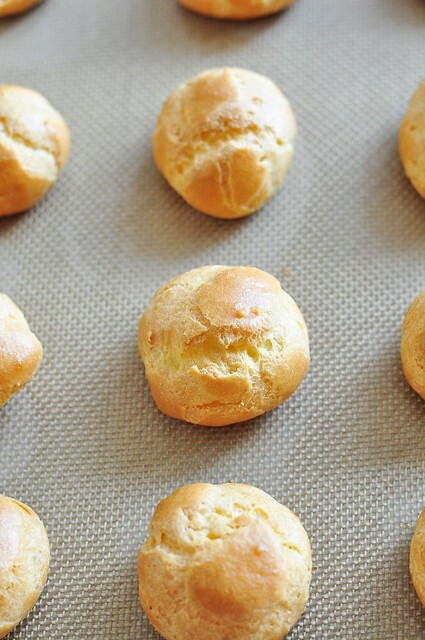 Pâte à choux has this uncanny ability to look completely and totally wrong through more than three quarters of the process. But at the very end you wind up with a gorgeously smooth and stretchy paste of a dough that magically bakes into light, airy puffs. This is pure culinary entertainment, people. 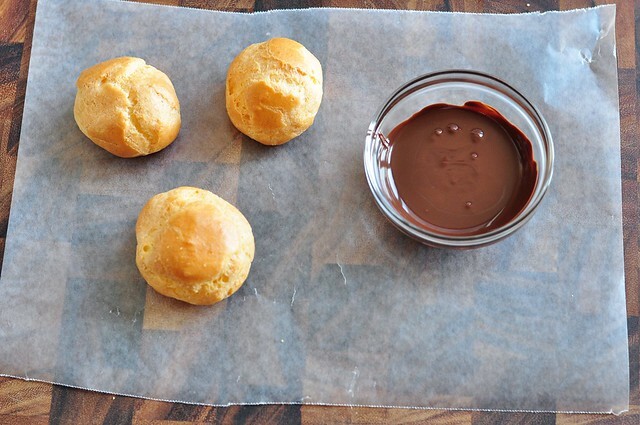 The variation on choux paste that I’m sharing here is the version that will make you cream puffs and profiteroles (it will also make you éclairs, but you’ll need to check out some of the other rally posts for more on that). The shells for both are the same, the difference being that profiteroles are filled with ice cream instead of whipped cream and capped with chocolate. I haven’t made an innovative or impressive version of either. 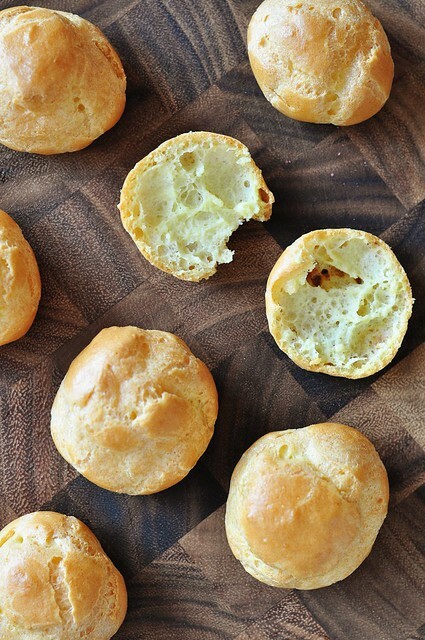 Instead I’m giving you the very basic method for each, hoping only that you’ll be inspired to try making pâte à choux for yourself. Deliciousness aside, I’m personally tempted to start making it on a daily basis—for the fun factor alone. If you’re not already accustomed to setting up a mise en place for your baking projects, do so for this. It comes together so quickly that you’re not going to want to be scrambling for anything. Preheat the oven to 400 degrees. Line a baking sheet with a silpat or parchment paper. In a small bowl, whisk together the millet, brown rice, and tapioca flours, and the xanthan gum. Combine the water, butter, salt, and sugar in a small saucepan. Set it over high heat, stirring frequently, until it comes to a simmer. Once it reaches a simmer, turn the heat down to medium and add the flour mixture all at once. Stir quickly to incorporate the flours. For several seconds, the mixture will look lumpy and it will seem as though the flours aren’t going blend in, but it will smooth out and become sticky. A few seconds later, the dough will start to pull away from the sides of the pan and form a ball. Once this happens, keep stirring and cook for another minute more. The dough will begin to look a little less smooth and you should see the butter just starting to separate out. Remove it from the heat and transfer the dough to the bowl of a stand mixer fitted with the paddle attachment. Alternately, transfer to a medium bowl, grab a heavy spoon, and prepare to stir. Let the dough cool for a brief moment–you still want it to be hot. Start the mixer going on medium-low speed and add in the first egg. The dough will start to look strange and lumpy, and it will seem as though the egg isn’t going to mix in. Turn the mixer up to medium. Add the second egg when the batter starts to look a little stringy. It will get lumpy again with the addition of the second egg, become stringy once more, and, after about a minute, it will smooth out into a stretchy, cohesive dough. If not using a stand mixer, add the eggs to the batter one at a time, stirring vigorously to incorporate. 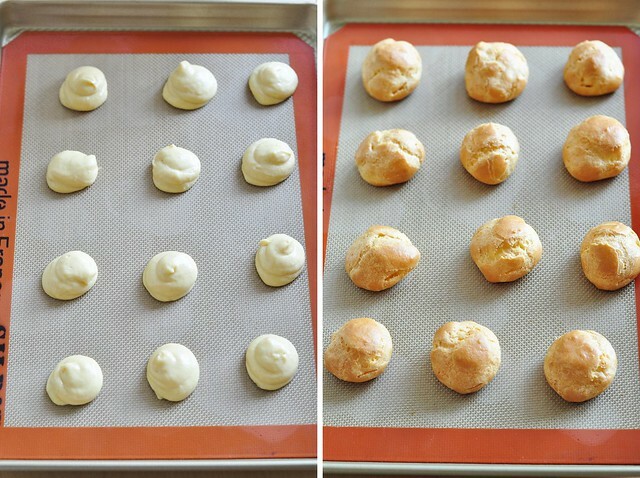 Transfer the dough to a pastry bag (or a food storage bag with the corner cut off) and pipe a dozen golfball-sized portions of choux paste onto the lined baking sheet. Bake at 400 degrees for 10 minutes. Reduce the oven temperature to 350 and bake for an additional 25-30 minutes, until the puffs are deeply golden and firm. Optional: To help dry out the insides of the puffs, remove from the oven when they’ve finished baking, poke each in the side with a sharp knife, and return to the oven for a couple minutes more. In the bowl of a stand mixer fitted with the whisk attachment, or in a medium bowl using an electric hand mixer, beat the cream until it begins to thicken. Continue mixing and slowly add in the sugar. Beat until the cream is fluffy and holds peaks. Cut prepared cream puffs in half and spoon generous portions of whipped cream into each. Place the chocolate in a small, heatproof bowl. Melt by microwaving for 20 second intervals, stirring in between, or by placing over a small saucepan filled shallowly with simmering water. Once melted, dip the tops of the puffs in the chocolate to coat. Place in the refrigerator for 5-10 minutes to allow the chocolate to become firm. Slice prepared puffs in half and fill with a small scoop of ice cream. 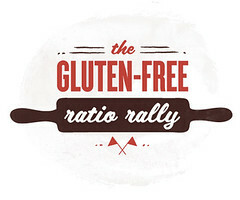 This month’s Ratio Rally was hosted by Erin of The Sensitive Epicure. Thanks, Erin! 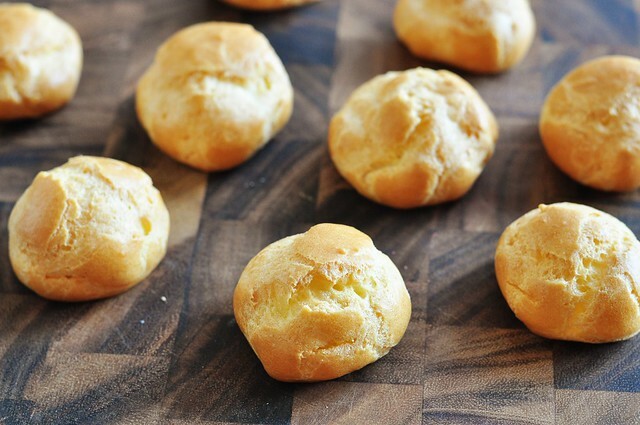 Head on over to her site and check out all the other amazing things that the rally participants made using pâte à choux. they’re so perfect! and your photos are lovely… totally thought my eyes were playing a trick on me with the no chocolate/chocolate-topped puffs. They look perfect – absolutely perfect!!!! Fantastic is all I have to see – the air pockets, the puff, everything, love it. These look amazing! You are so talented. I cannot wait to try them. I love how you put this: Make it. I couldn’t agree more. So simple and beautiful. Yours turned out great! Nice work! And so puffy! Thanks for participating. They looks perfect, absolute cuteness!!! I saved this recipe as soon as I saw it, and made these today. I live at 6500 feet above sea level, and with zero adjustments for altitude, they STILL came out perfectly. (I did have to sub sorghum for the millet based on what I have on hand.) They were delicious and fluffy and light – I ate half of the batch in one sitting. THANK YOU for this keeper of a recipe!!!!!!! Simple they may be, but beautiful! This is now on my list for next week, especially since they’re so versatile and adaptable. And a question – is there a way to join the Ratio Rally? It looks like a great learning tool for GF baking. I made these today and they turned out beautifully!! Your instructions were perfect! I wouldn’t have dared to try them ever if you hadn’t laid out in detail all the steps and the changes in the dough. THANK YOU!!! I can’t wait to try GF. But I’ve made these wonders for many years, even serve them with Chicken salad and many other sandwiches. Also you can spice them up with basil yum! !